It’s interesting, isn’t it, how one minor incident in a lifetime can trigger a perpetual memory that reappears every time the incident is repeated? Take, for instance, the daily task of squeegeeing the glass shower door. It occurred to me this morning that the minute I begin to wipe down the shower with the squeegee, I think of Chad—a man I haven’t laid eyes on for at least fifteen years. Chad came to work for me at WM Life in Seattle as a part-time clerk in the early ‘90s—he was freshman at Seattle Community College. He was smart, trainable, a quirky and delightful addition to my staff. He proved to be loyal and hardworking—as good as anyone who ever reported to me, but that’s a topic for a different post. He worked for me on and off for a number of years—eventually leaving to attend Evergreen College in Olympia. Sometime after graduation and a full-time job, he contacted me. He had started his own window-washing business. Did I need any windows washed? Glad to patronize his start-up, I answered “yes,” and a few days later he drove up our driveway in his old VW Van, loaded up with everything he needed to do the outside widows all around the house—some at ground level, and others needing extension pole or a ladder. Jay was delighted to delegate and pay for the service, and Chad did a splendid job (and returned for seasonal work until he found other work). Yes, I’m getting to the point of my first sentence. It was Chad who showed me the most efficient way to use a squeegee. 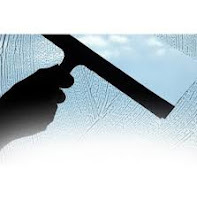 Until then, I had always stroked parallel lines from top to bottom of the window (I’d been washing inside windows for at least forty years by then—much more frequently than now, I must admit). Chad showed me how to swoop across the window in figure-8 motions, eliminating the constant need to wipe the drips at sill-level. Only one wipe was needed with Chad’s method. And that’s why I think of Chad every morning, as I begin the figure-8 motion along the inside of the glass shower stall. Who would have thought . . . When we think about it, it’s not any different from the memories popping up as we set out our beloved Christmas decorations. It’s the association with a person or event that causes such sentimentality. But who would have thought a window-washing tip could become a daily trigger of recall, one of great affection. Chad, by the way, is now a successful chiropractor—and, by my rough calculation—is in his mid-forties by now. When I think of him, though, it’s as a young man whose honesty, truthfulness, loyalty and hard work endeared himself to his boss. Not white? OK, as long as it's not blue!